Now that the comic book movie has proven to be not only a financial windfall at the box office, but also a new way to deliver solid stories to skeptical audiences there have been an influx of new mediums reaching kids and adults these days. The newest to enter the fray is Avengers: Earth's Mightiest Heroes, a re-telling of some of the most classic Avenger's stories for modern audiences. Now that the first season has finished up the DVD has hit shelves in a 3 volume pack. The first of these is titled Heroes Assemble which, for those of you who don't know, is an allude to the rallying cry of Captain America, only his goes "Avenger's Assemble!" The story opens with a series of short vignette's that have been compiled into 22 minute episodes. Each one is an introduction to key characters in the team. First up is "Iron Man is Born!" which features the now well-known Tony Stark and his attempts to stop his weapons from reaching the hands of our enemies. The difference with this tale is that instead of a Middle Eastern threat like in the live action movie starring Robert Downey Jr., the threats are drawn from the comics themselves. Groups like Hydra and A.I.M. are the most dangerous threats Iron Man faces. Next up is "Thor the Mighty" where the God of Thunder faces off against a horde of giants and trolls as he defends his home of Asgard. In "Hulk versus The World" we see Bruce Banner attempt the stop the government from capturing and experimenting on other gamma infected villains. "Meet Captain America" takes us back the end of World War 2 where Captain America is facing off in what will be his final battle against the Red Skull. Finally we are introduced to Ant Man in "The Man in the Ant Hill" who more commonly known as Hank Pym, tries to utilize science towards humanitarian goals. Each of these introductions, in their own way, wind up intersecting with one another so that in the final two episodes on Vol. 1 we understand what it is that finally brings these heroes together. Those two episodes, titled Breakout Part 1 & 2, feature a massive prison break from all five of the super powered prisons designed to contain criminals of that nature. The last prison to fall harbors a deadly villain named Gravitron, who was once a scientist working for S.H.I.E.L.D. on alternative ideas for a super soldier. When his experiment backfires, as we know it will, it grants him the ability to manipulate and control gravity itself. Some quick thinking knocks him out and for the past ten years he has been in stasis thanks to S.H.I.E.L.D. When he awakens he goes on a city wide rampage trying to find Nick Fury, the director of S.H.I.E.L.D. This draws the attention of Thor, who is residing in New York at the moment. He answers the call to battle as does Iron Man, Wasp and Ant Man. As the battle gets under way it is clear they are barely able to stand up to Gravitron, his powers seem impossible to conquer. That is until The Hulk shows up, tipping the scales of battle in their favor. Part 2 sees the defeat of Gravitron and the formation of The Avengers. The DVD only offers one extra and that is a look into the upcoming events of season two. Supervising Producer Josh Fine and Story Editor Chris Yost give insights into the designs for the characters, how they came up with storylines for season one and finally a hint at what will be in store for the characters in season two. Volume 1 of Avengers is a solid start to a reinvigoration of a classic team from the people at Marvel. 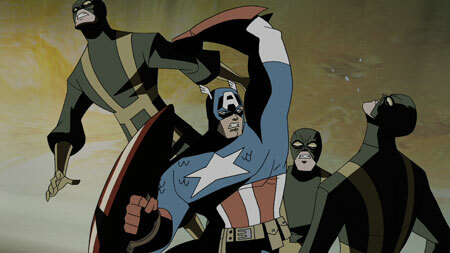 Purchase a copy of Marvel The Avengers: Earth's Mightiest Heroes, Vol. 1 from Amazon.com.